Ever visited a place and immediately felt like you belonged there? Yeah? Me too. From deep green rainforests to expansive coastal beaches, rugged mountains, snow capped volcanoes, massive glaciers, and a whole lot of really good coffee, Washington has something for everyone. I've felt a special affinity for the Pacific Northwest for a long time. Trips to Olympic National Park and Mount Rainier National Park are what started it all, and it's incredible to see such ecological diversity all in one place. But I had yet to spend significant time in Seattle or any time in the Cascades - two problems I aimed to fix with one jam packed trip out west. Our plan was to get to know the city and its neighborhoods, and then head for the hills. 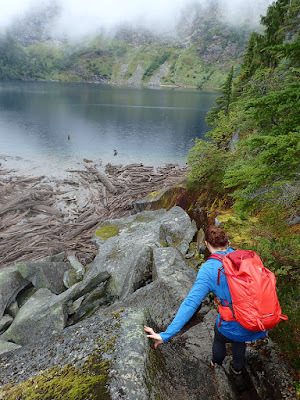 I knew I wanted to find enough to fill our four trail days with alpine lakes, time above ridgeline, or a combination of the two. I made a list of hikes that met those criteria and others, including covering 8-12 miles, 2,000-4,000' of elevation gain, and with photos that made me go, "WOW." After two days in Seattle, complete with a Theo Chocolate factory tour, TNT Tacos, an early morning run around Green Lake, a stop at Pike Place, nitro cold brew at Seattle Coffee Works, a visit to the Ballard Farmer's Market, beer at Ruben's Brews, and much more, we drove north, turning on to the North Cascades Highway. Our first destination? An uphill hike to Thornton Lakes, and potentially, a scramble up 5,996' Trapper Peak. 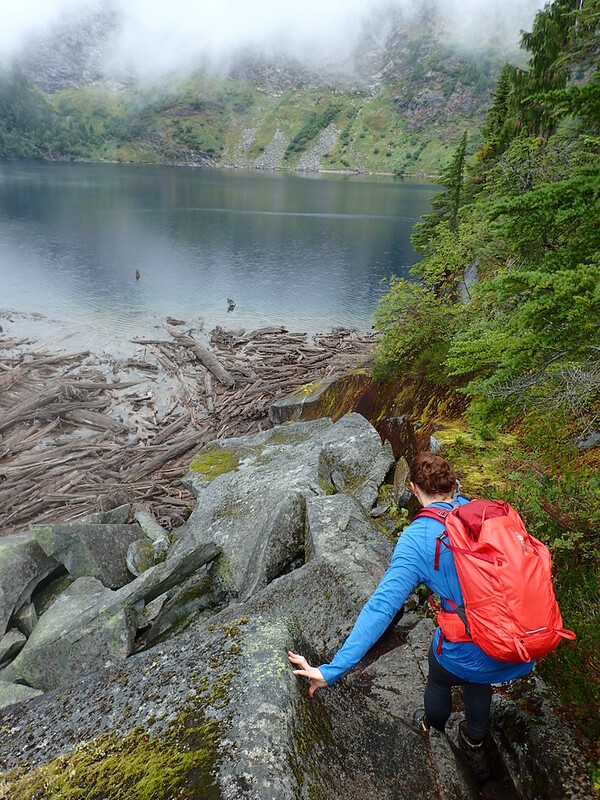 Making our way up to the Thornton Lakes trailhead was almost as challenging as the trail itself. Thornton Lakes Road is a small turnoff about 12 miles east of Marblemount, Washington along the North Cascades Highway, and though we did see a Toyota Corolla in the parking lot when we finally made it the requisite five miles up the extremely bumpy, rocky, narrow road, I was glad we had a high clearance vehicle. We were only two and a half hours from Seattle, but it felt like we were beyond the middle of nowhere, and I loved it. From the parking lot, the Thornton Lakes Trail traverses a hillside, crosses a few small creeks, and doesn't climb much at first. It's wide at points, wide enough for hikers to walk side by side. My hiking partner and I chatted about how it looked like an old road, and in fact, it is, for around two miles. The road is left over from a period of logging in the area in the 1960's, according to my guidebook. 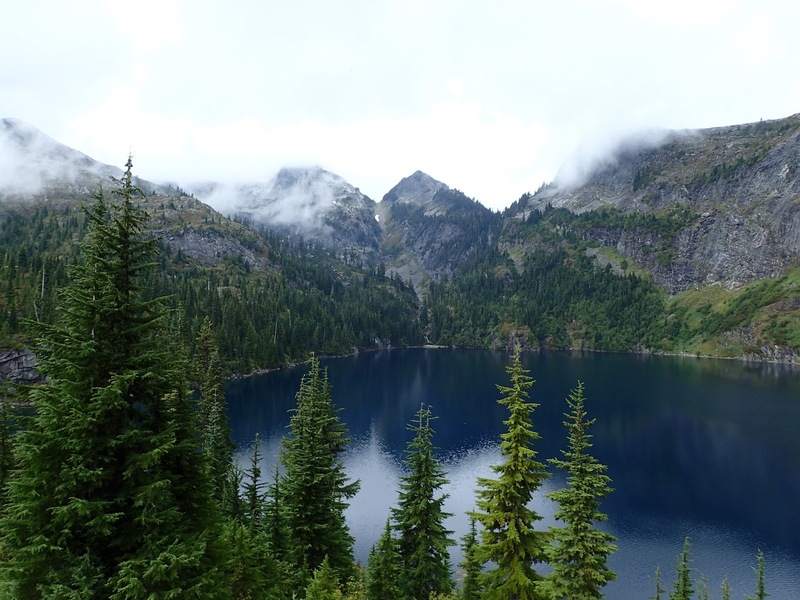 I found myself even more grateful for the creation of North Cascades National Park in 1968 to protect the land. The old road narrows, starts to look more like a hiking trail, and that's when the climbing begins. The trail turns up a hill and hikers cover what seems like an endless series of ruddy dirty switchbacks through beautiful, dense, dark forest land. As we hopped over roots, hopping being a generous term given the elevation we were gaining, I couldn't help but notice how incredibly fresh, clean, and sweet the air smelled. After climbing a while, we came across a small, unobtrusive sign post sitting next to the trail. It was there to let us know where the North Cascades National Park boundary was, and I had a blast hopping from one side of the invisible line to the other, with one foot in the park and one outside of it at times. 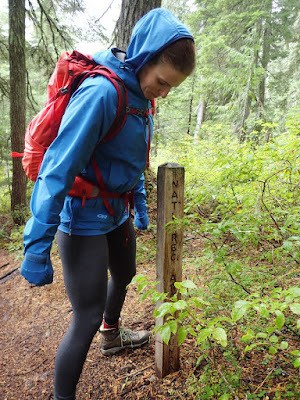 Finally, we reached a trail junction indicating we had a choice to make - continue up about a mile and 900' to the top of Trapper Peak, drop down 500' in elevation over half mile to the lowest of the three Thornton Lakes, or both. (Turning right around was not an option, but it can be!) 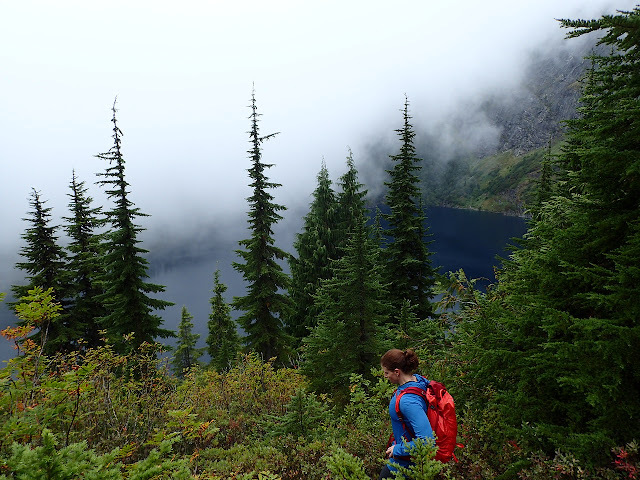 The weather was characteristically cloudy and damp, and when we arrived at the junction, the trail to Trapper Peak disappeared into a puff of fast-moving clouds. To Climb, or Not to Climb? Rather than risk losing the trail for views we weren't likely to get a chance to enjoy, and in order to avoid getting back to the car in the dark (we started at 11am) for a harrowing drive back down to the North Cascades Highway, we opted to just pay the lake a visit and head back. I'm completely and entirely in love with all things alpine lake-related, and we couldn't even see Trapper Peak with the clouds, so it was an easy choice. Had the weather been better, it would've been a tougher call. As good of a view as we were going to get, with Trapper Peak out of sight in the right of the frame. Still gorgeous! Though the trail down to the lake is obvious, it was easy to get slightly off course at times following side trails up and around the hills. As we wandered down to the lake, the clouds cleared momentarily, giving us a peek at the peak we wouldn't climb on this trip. It was stunning, rugged, and seemed so easily accessible. In a moment, it disappeared again. But man, the lake was absolutely gorgeous. Even without sun shining down on the dark blue water, it was obvious how stunning the landscape was. We made it across a large pile of logs to a handful of backcountry campsites, which was no easy feat given the wet weather. 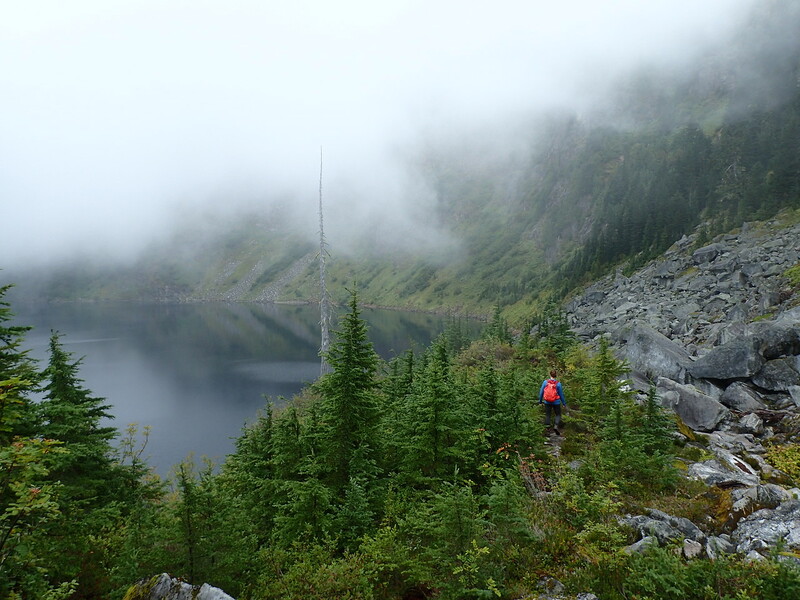 After about a half hour of exploring, we hoofed it back up above the lake, decided Trapper Peak, shrouded by clouds and completely hidden again, wasn't going to happen. The hike down felt comparatively easy, and in total, it took us about five hours to complete the entire journey. Grab a copy of this book and this map if, like me, you and want to know everything there is to know about a trail before hiking it. It was helpful in understanding how to get there, and wta.org helped a lot as well. The NPS provides a PDF map that's much less detailed. All of the trail descriptions I read clocked the total mileage for the hike at 10.2 miles, but based on MapMyRun, our route, not including the jaunt to the campsites, was around eight miles. Though we did see some smaller cars in the very tiny parking lot at the trailhead, I definitely recommend a high clearance vehicle for the extremely bumpy road. You don't need a parking pass, but if you're planning an overnight, you'll need to grab a backcountry permit from a ranger station. And crossing Trapper Creek to get to the campsites can be a little dicey if the logs are wet. If you were me, would you have gone up the peak anyway? 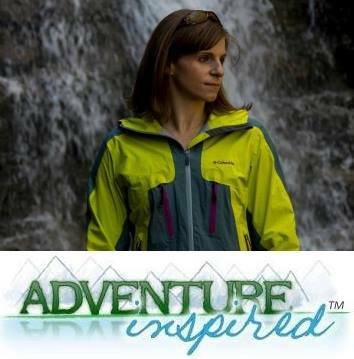 Have you done this hike, or other hikes in the North Cascades that you'd recommend to a friend? 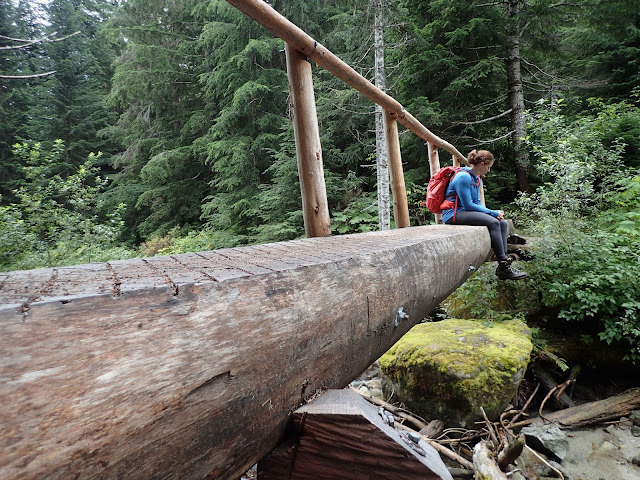 It's a bit too late for our trip, but I'm super interested in what other PNW hikers recommend doing!